Dubai, UAE, October 04, 2018: H.E. 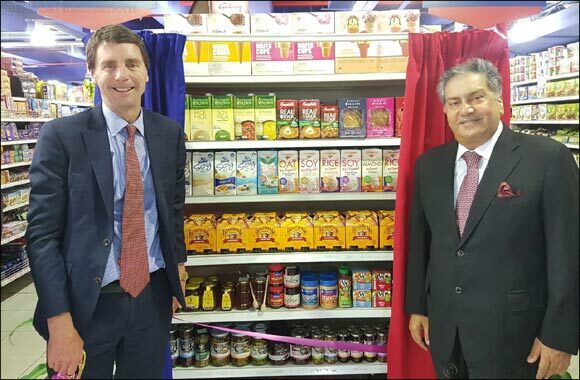 Mr Ian Halliday, who has very recently taken over as Consul General of Australia to Dubai visited Al Maya Group’s flagship Supermarket in Dubai. This is H.E. Mr Ian Halliday’s first visit to the Supermarket. Mr Kamal Vachani, Group Director, Al Maya Group welcomed H.E. Mr Ian Halliday to Al Maya Supermarket. During the interaction with Consul General, Mr Kamal Vachani introduced Al Maya Group and its activities to H.E. He informed the Consul General about the products available from the Australia at the Al Maya Supermarkets and also the brands being distributed by Al Maya Group from Australia. Consul General of Australia mentioned during the visit to Al Maya Supermarket that I am very much impressed with Al Maya Group’s activities and happy that a large number of Australian brands have been stocked and distributed by Al Maya in the UAE. Al Maya Group is keen to expand its products portfolio from Australia, Mr. Kamal Vachani informed Consul General who visited Al Maya Supermarket recently. Also present during the visit was Mr Moin Anwar, Commissioner (Middle East), New South Wales Government. Mr Moin Anwar commented that Al Maya is a valued partner in UAE to launch innovative and new products from New South Wales.